Image Sizes: 6 X 12, 8 X 10 and 9 X 12 in. Each box set includes a series of 12 limited edition giclee canvas prints on board. Offers a 2 page guide of the marvelous sites and documents the thoughts and inspiration of Michael Flohr's artworks. 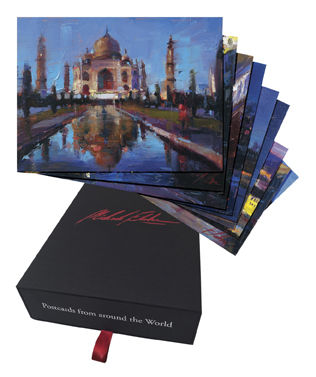 Each piece is hand signed and numbered by Michael Flohr. The set is packaged in a beautiful collector box, an exclusive edition of only 195 in the set and includes a certificate of authenticity. Enamored (Egypt Pyramids) - 6 x 12 in. Capital Building, Washington - 9 x 12 in. Amsterdam - 9 x 12 in. Taj Mahal - 9 x 12 in. Grand Canal, Venice - 9 x 12 in. London Bridge, London Tower - 9 x 12 in. Twilight in Florence - 6 x 12 in. Historic St. Charles, South Carolina - 12 x 9 in. Metropolitan Cathedral, Mexico City - 9 x 12 in. Cuban Night Cap - 12 x 6 in. Dreams of Madrid - 9 x 12 in. Reflections in Paris - 10 X 8 in.